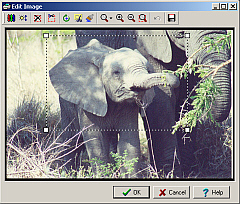 The image editor can also be opened by selecting one of the 'Crop Image' options. In that case, the image editor is opened in Crop mode. Note that the 'Crop Image' options are not available when using the Simplified Interface. Crop selection Crops the image to the selected range. Rotate and Flip Opens the rotate dialog, allowing arbitrary rotation and horizontal/vertical flipping. Crop Image Places the editor into Crop mode allowing precise adjustment of cropping. Effects Opens the effects dialog allowing special effects such as blur and sharpen. Zoom Zoom to window, or to a preset percentage of actual size. Zoom to selection Zoom to show selected area. Save Opens the Save image dialog.